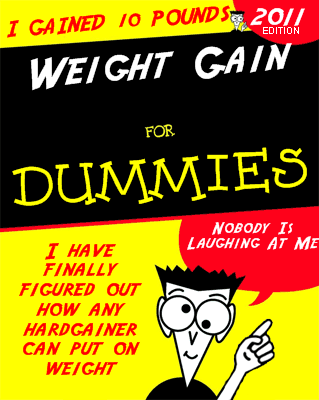 Are you a hardgainer, is weight gain a big problem? I t's been proven that hard gainers and weight gain just don't go hand in hand, but it is also a know fact that no matter how much they eat they still can't gain weight even if they consume the most fatty foods known. Many hard gainers don't even understand why they can't put on a couple pounds no matter how much food they eat on a daily basis. Then why is it that one person can eat way less and put on weight and the hard gainer not. The truth: It's all in how the hard gainer eats and the way he eat his meals during the day. The only way to prove what I have just written there is to observe what takes place daily. Monitor things like how often they eat, how many meals per day and the amount of calories digested daily. If you're having a hard time putting on weight then you will be surprised to learn what it is exactly that is keeping you from gaining weight. To add a couple pounds is possible once you understand that any weight gain can only be achieved by following a specific eating routine. This has always been a topic of discussion in my life. As a youngster I was very thin, and people always said that I was a starved out kid. But the truth is I ate a lot, but couldn't put on any weight no matter what I did. I could eat a cow... a figure of speech, and wouldn't gain a pound. Sounds familiar? As time went by, I gave up trying to gain weight, it just didn't make sense. Do You Know Why You Can't Gain Weight? There are thousands of people who have problems with their weight. Some say weight loss is more difficult when it compares to gaining weight. What I say is that they are both the same. When you're overweight, you are consuming way more calories than you burn. On the flip side is when you're underweight, you consume far too less calories on a daily basis. The trade off for a thin person is to learn how to eat like a fat person, while the fat individual have to learn how to eat like a skinny person. ...it all sounds simple, but I have been there and I know it is far more complicated. What I have decided to do is to try and guide you and show you exactly what I did to put on weight. Now today, I know exactly why gaining weight was a problem for me, and how to pack on the pounds in a very short time, three months to be exact. In three months I can add 20 to 30 pounds to my slender frame by following the weight gain method I formulated. The concept for this website is to show you exactly how to gain weight fast, while gaining some muscle tone in the process. This will work for you, even if you are extremely thin. I am not talking about becoming a body builder here, just a fit and healthy looking individual with slight muscle tone. If you're on this site, then I know you would be happy to add even just ten pounds to your thin frame. So do the right thing NOW. Please subscribe to my monthly newsletter, Weight Gain Info. There is a lot I wish to show and share with you, and I don't want you to miss anything. You will see exactly how I gained weight. Understanding how to pack on the pounds is a simple process, it basically means eating more calories than you consume on a daily basis, in laymen terms--- just eat like a pig. For some this will seem like a burden, but the average thin person only eats three times a day, and I can guarantee you that those extra skinny frames out there eat even less times per day. They don't snack, they eat huge amounts of food in one sitting. Would you like to share your knowledge about weight gain? Great, find out how you can submit your story or tip here.